This book is the first in a new series of modeling books by Osprey and is a basic introduction to modeling the Harrier. This 80 page soft cover book opens with an introduction to the Harrier in model form, and follows it up with a chapter on tools of the trade. Then the fun starts. The third chapter takes the old Airfix 1/72 P. 1127 kit and brings it up to a more current standard. The author does a good job illustrating basic modeling and scratch building techniques, but unfortunately builds the Harrier with the outriggers on backwords. Oops! The fourth chapter is a gallery of 1/72 scale Harrier models with some very interesting schemes. We now get to the 1/48 section of the book with a chapter on scratch building a Harrier cockpit, and a set of landing gear for the 1/48 Airfix GR. 3. This chapter also explains weathering techniques and figure painting. We then have a gallery of 1/48 scale Harriers including a series of spectacular Harriers by Piero de Santis. The next chapter deals with the big one…the 1/24 scale Airfix Sea Harrier. A full build of this big Harrier is covered and the modeler does an excellent job of hand painting this monster! To close out the modeling section of the book, a short chapter is devoted to display bases and dioramas. The last three chapters are a wrap up of available kits, a references section, and a short walk around of a RAF Harrier GR. 7. There is a flap in the book with some paint chips of various Harrier schemes. The book is illustrated throughout with many excellent colour photos. Unfortunately, I do have a few complaints with the book. The first is that in a few of the chapters models are shown but never appear as a finished product. 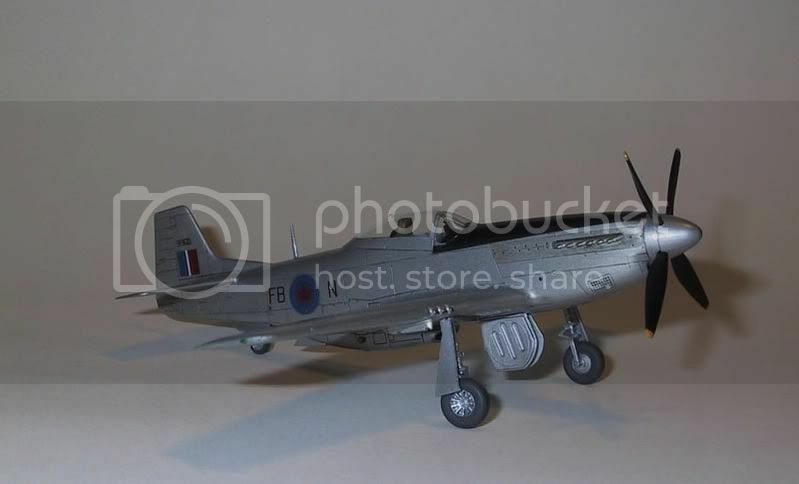 For example the 1/48 Harrier GR. 3 is never shown as a finished model and appears in a few photos in the late 80s gray scheme. Also, some of the kit recommendations are interesting. In 1/72 the book recommends the Hasegawa series of Harrier Is as best in the scale. Unfortunately, these kits have some shape problems in the nose area. Most contend that the Esci/Italeri 1/72 Harriers are the best in the scale. Also, the nice 1/48 Monogram AV-8A is never mentioned in the book. 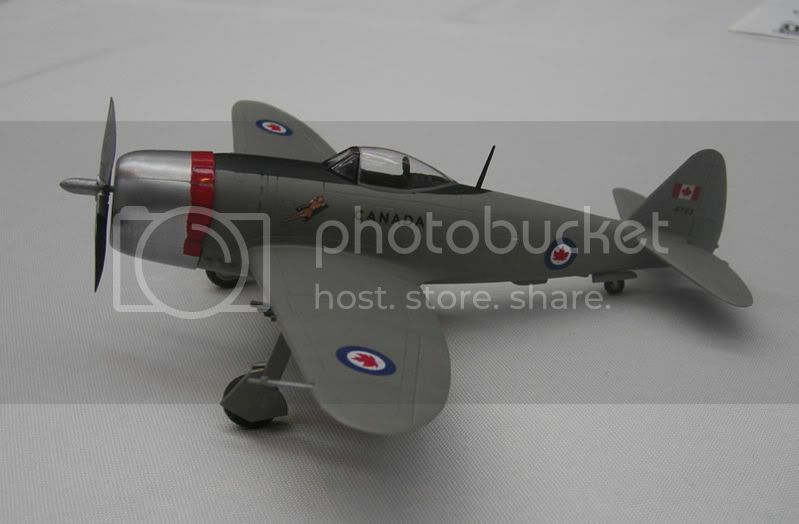 Lastly, many European modeling products are mention that may not be available to U.S. modelers. Too bad some English to U.S. modeling translation wasn’t supplied. Even though this book isn’t perfect, I enjoyed it and I recommended it to anyone who wants to know more about modeling the Harrier. I look forward to future books in the series. The Spitfire Mk. V is arguable the most popular and famous of the Spitfire family and is the subject of Mushroom Model Publication’s lasted book. There are many excellent Spitfire books; however, most of them cover the Spitfire family and not a particular variant. So this book is very refreshing in that respect. In their promotional material Mushroom Model Publications state that the book contains “new facts and new research.” They have not just reiterated Spitfire legend, but have approached many issues anew and drawn new conclusions. These include Operation Jubilee stripes, and the controversial Malta Spitfires. The book is a 128 page paperback and has 195 photos and 49 colour profiles. The first chapter deals with development of the Mk. VA, VB, and VC series. Even such one offs as the Floatfire, two seaters, and the DB-605 Spitfire are covered. This chapter is rounded out with a production summary with serial number blocks. Next up is RAF and Fleet Air Arm use, with listings of all RAF squadrons that operated the Spitfire as well many photos. Camouflage and markings are covered in the next chapter and this is where some of the controversial issues arise. I agree with the author with regard to many of the issues he discusses, but I doubt anyone will every be able to confirm how Malta Spitfires were painted. The next chapter deals with foreign users of the Spitfire including the United State. The author states that Canada only operated Spitfires in RAF units, but at least one Spitfire VB (ER824) was flown in Canada. The next chapter is a technical description of the Spitfire including many drawings. One word of warning is that the wing bulges are missing from the Spitfire VC wing drawing on page 78. Lastly, we have a set of 1/72 Spitfire V drawings, some colour photos of restored Spitfires, one page of World War II era colour photos and a nice set of colour profiles. Tucked into the colour profiles is one colour shot of a Malta Spitfire. Overall this is an excellent introduction to the Spitfire Mk. V and I highly recommend this book for anyone looking for a one-stop reference on the Spitfire Mk. V.
Thanks to John Noack and Mushroom Model Publications for the review sample. Back in 1997, Patrick Martin wrote book on Canadian Armed Forces aircraft markings that was a gold mine of information but was let down by poor printing and production values. After completing his book on RCAF markings, he decided to revisit the earlier book and upgrade it both in content and add the latest CAF aircraft. The book revisits earlier territory it is almost all new. A few photographs from the first book make it into this issue, but the layout and drawing are all new. In fact it very much resembles the RCAF book both in style. The book is 296 pages long with colour card covers encased behind clear sheets. It is spiral bound and includes a colour center section. After a short introduction and a table of contents the main text of the book covers CAF schemes in detail. Schemes, types, colours, markings, and insignia are all discussed and illustrated with many black and white photos and drawings. The colour section includes colour chips, some marking diagrams, and almost 100 photos of CAF types. Including, of course, are quite a few colourful Hornets. The largest section of the book details every type of aircraft operated by the Canadian Armed Forces in alphabetic order and all the schemes they have carried. There are drawings and photographs to illustrate the schemes. Photographs usually cover one off special schemes as no drawings were done for these aircraft. Types span everything from the Grumman Albatross to the Canadair Yukon. Other aircraft included within this section are Starfighters, Hornets, Voodoos, CF-5s, helicopters of many variants, Airbus, 707s, Hercules, the new Hawk, Harvard II and Cormorant, and much more. The Appendix has a few extra photos of various Maple Flag aircraft, and some civil Hawker Hunters used in Canada and a listing of aircraft serials. There are also bonus colour photos on the insides and outside of the colour card covers. Productions values are much improved in this issue. There is still the odd typo and text overlaying photos, but my understanding is that Patrick is aware of these problems and they have been corrected with more recent issues of the book. I just wish the book could have been full colour and all the photos were full page! Overall this is a stunning book and a must for all CAF modelers. A lifetime of modeling inspiration can be found within the covers. Don’t let the price scare you off; this book is worth every penny. Excellent! After defending the British Islands from the German invasion in the Battle of Britain, most Hawker Hurricanes were relegated to other theaters of combat such as Malta and North Africa. These aircraft were often equipped with special “tropical” engine filters. The Tropical Hurricane is one of the latest boxings of the Sweet 1/144 Hurricane Mk. I kit. The best way to review the Sweet Hurricane is to just reference the name of the company. This is a sweet kit! The kit comes in a neat box with colorful Japanese style cartoons. There are some great hints and tips on the box; such as if your cat knocks your liquid glue onto your model, you will be left with a pile of molten plastic. Anyway, on to the review, within the box there are two complete kits. One is in tan plastic and the second kit is in clear. By cleverly molding two canopies on each sprue there are two clear canopies and two tan canopies that can be used as masks. I decided to build the tan kit. The detail on the exterior parts is excellent, in fact this looks like a mini-Tamiya kit. Interior detail is a simple seat/headrest molding that is adequate for the scale and size of the very small canopy. You are given the choice of two props and two styles of antenna masts. All the parts fit very well and I only had to use a small touch of Mr. Surfacer in a few spots. In fact most of the problems I had with this kit are due to my hamfistedness with the small size of the parts. The kit provides five decal options all in variations of Dark Earth and Mid Stone over Azure Blue. I decided to do something different and built my Hurricane as a PR Hurricane based on Malta in overall Azure Blue. The decals went on beautifully, but it looks to me as if some are slightly too large. I highly recommend this kit. It is quite simple and very beautifully done. Good job Sweet. Thanks to Sweet, John Noack, and IPMS/USA for the review sample. April 1 marks the 84th anniversary of the founding of the Royal Canadian Air Force. 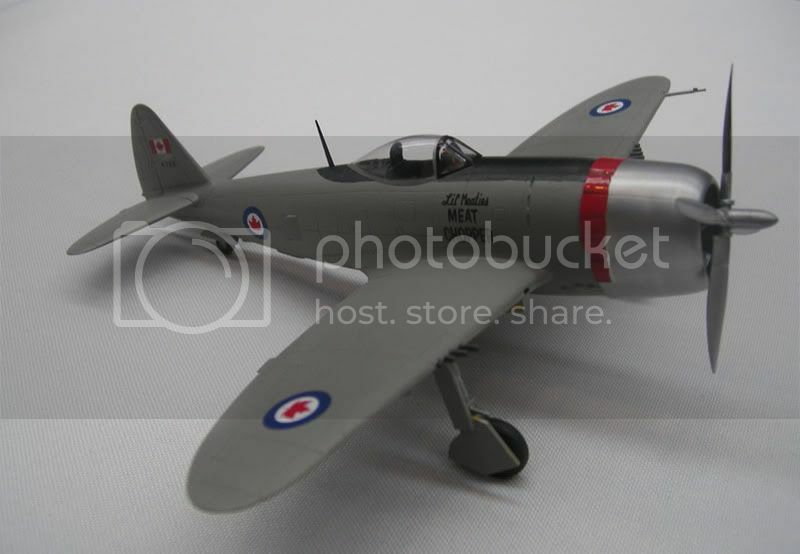 In celebration of that event, two famous members of the RCAF are illustrated in 1/72 scale. 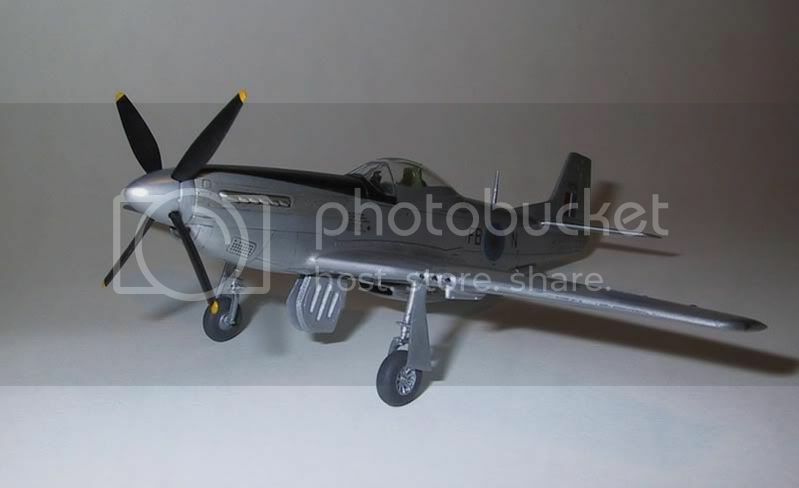 The P-51D Mustang IV was built from the Hasegawa kit in CEPE markings and the infamous CF-47 Maplebolt was built from the Academy kit in RCAF Korean War Contingent markings. Happy April Fools!